Hardware Limit Timer (HLT) module is a watchdog timer designed for the Complimentary Output Generator (COG) but its interrupt output can be used to trigger other actions. It has a set point and a running counter that is incremented by the system instruction clock (Fosc/4). When the running counter value matches the set point, the output of the HLT triggers an external shutdown input to the COG module operation. External shutdown inputs provide the fastest way to safely suspend COG operation in the event of a fault condition. The match also triggers an interrupt which can then be used in an interrupt service routine to take action on other peripherals. The structure of the HLT is similar to a Timer 2 module as seen in the lower portion of the block diagram below. The upper portion shows the signals that can cause the HLT to reset the incremental counter. The Hardware Limit Timer (HLT) is similar to any PIC® MCU Timer 2 module. The clock input to the HLT module is the system instruction clock (Fosc/4). 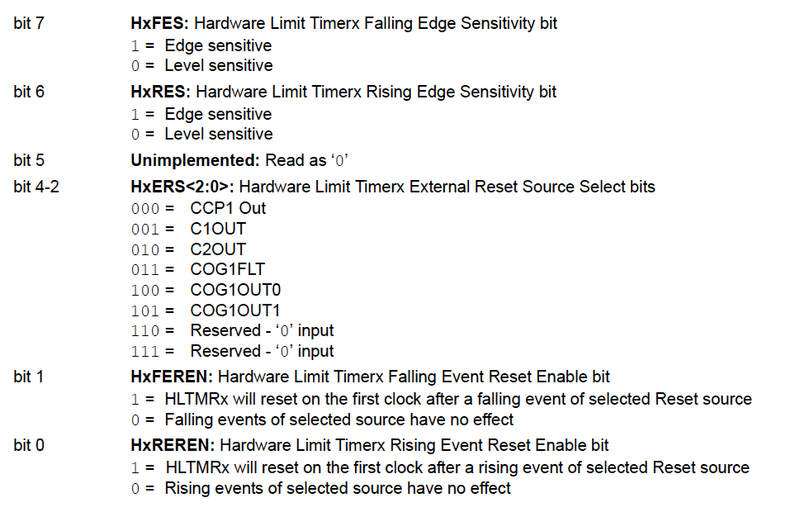 The Hardware Limit Timer Register (HLTMRx) increments on each rising clock edge. The value of HLTMRx register is compared to that of the Hardware Limit Timer Period register (HLTPRx), on each clock cycle. When the two values match, the comparator generates a match signal as the HLTimerx output. This signal also resets the value of HLTMRx to 00h on the next clock rising edge and drives Complimentary Output Generator (COG) output along with the output counter/postscaler. 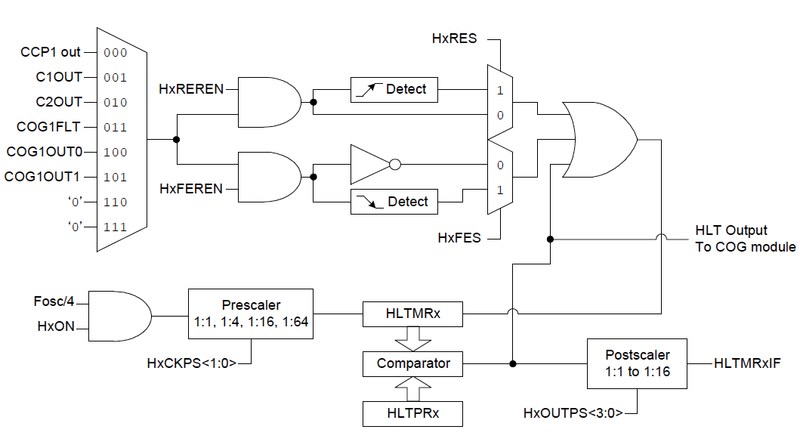 The prescale options are selected by the prescaler control bits, HxCKPS<1:0> of the HLTxCON0 register. The output of the HLT can be directed to the COG module and also to the HLT output postscaler. 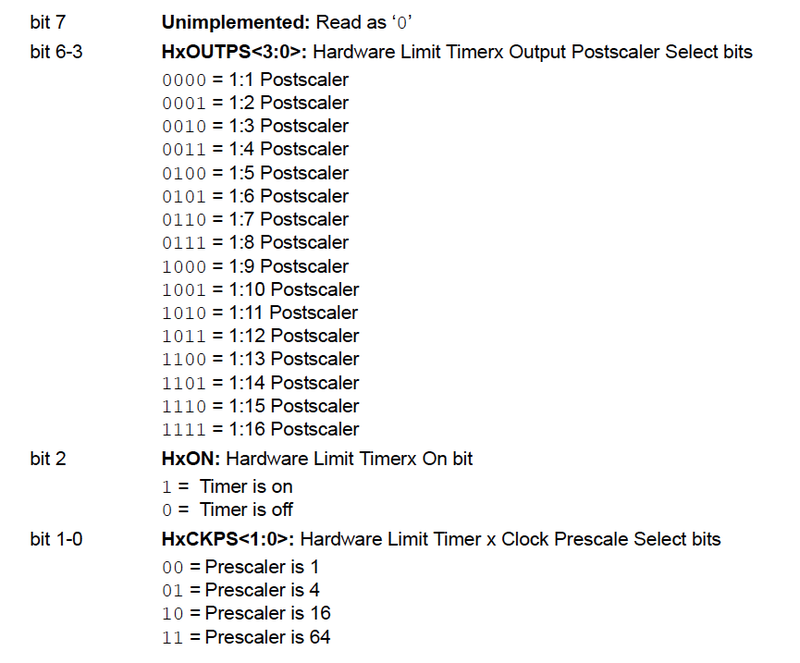 The postscaler can also be set to delay the HLT Interrupt from 1 match on up to 16 matches. This is selected by the HxOUTPS<3:0> bits in the HLTxCON0 register.